Limited-time Special Theme Park Ticket offer. Get tickets as low as $70 per day + save up to 25% on select rooms at Disneyland® Resort. Restrictions and exclusions may apply. Special theme park ticket offer is also available in four-day and five-day options. Hotel savings offer is valid on Sunday - Thursday nights in DEAL room categories. Hotel savings vary depending on date of travel. Hotel savings offer blackout dates: 3/20/19 – 4/13/19. Plan for enough days to discover two amazing Theme Parks at the Disneyland® Resort! In 2019, guests will continue to enjoy spectacular entertainment, favorite festivals, the newly reimagined Pixar Pier, Super Hero experiences, and the biggest celebration ever for Mickey Mouse and Minnie Mouse. When you upgrade to a Disneyland® Resort Park Hopper® Ticket, you can experience the magic of both Parks in one day. When you stay at a Disneyland® Resort Hotel, you’ll stay where the magic never ends. With Disneyland® Park, Disney California Adventure® Park, and the Downtown Disney® District just steps away, you’ll enjoy convenient access to all the fun! Plus, you can take advantage of benefits, including early access to the Theme Parks on select days and Disney Character wake-up calls. And, throughout your stay, you’ll experience legendary Disney service. Bask in the magic of the late 19th-century Arts and Crafts movement at this premium hotel. Savor award-winning food, indulge your senses at the world-class spa, or lounge the day away in a posh poolside cabana. Boasting a stunning 6-story lobby constructed of stone and wood plus stately American Craftsman-style décor in all rooms, Disney’s Grand Californian Hotel® & Spa celebrates the grandeur of the great outdoors. Be surrounded in the spirit and wonder of Disneyland® Park past and present. Stay in the Adventure, Fantasy or Frontier tower, each an homage in sight and sound to the Park’s original lands—and delight in the hotel’s sleek, ultra-modern design that surrounds you at every turn. Located just steps from the Downtown Disney® District, the hotel is a short stroll to both Disneyland® Park and Disney California Adventure® Park. Celebrate the heyday of California beachfront boardwalks at Disney’s Paradise Pier® Hotel. Step back in time at this old-fashioned yet modern hotel—home to a variety of dining, shopping, and recreation opportunities—and ride a wave of relaxation from your charming seaside-themed room all the way up to the rooftop pool for some welcome fun in the sun. No matter which Disneyland® Resort Hotel you choose, you’ll enjoy tremendous benefits including early access to the Theme Parks, on-site Disney Character Dining, and convenient access to all the magic. 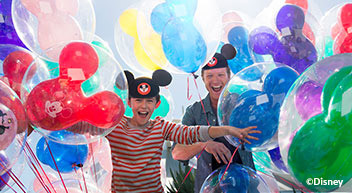 ​Allows guests to choose between Disneyland® Park and Disney California Adventure® Park on each day of their ticket. 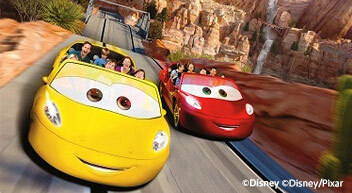 ​Allows guests to visit both Disneyland® Park and Disney California Adventure® Park on the same day. 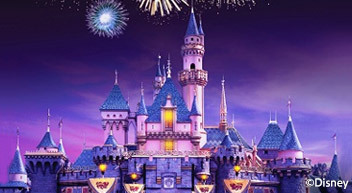 Guests with Disneyland® Resort Tickets of three or more days enjoy one Magic Morning early admission during their ticket duration to select attractions, stores, entertainment, and dining one hour before the Park opens to the general public on select days. In Disneyland® Park, stroll down Main Street, U.S.A., where Walt Disney’s original vision still captures your heart and transports you to faraway places you could only dream about. Embrace world-famous classics like “it’s a small world,” the slicked icy slopes of the Matterhorn Bobsleds, and those beloved Disney Characters you’re never too old to hug. Then blast off into the Star Wars™ universe on over 50 possible 3-D adventures aboard Star Tours—The Adventures Continue. And see the forces of good and evil battling it out in Mickey’s dream during Fantasmic!—a nighttime, outdoor extravagant musical. Explore Disney California Adventure® Park where Buena Vista Street welcomes you to the 1920s when inspired young filmmaker Walt Disney first arrived in Los Angeles. Now get ready to rev your engines because that’s the town of Radiator Springs you see rising up on the horizon. You’ll be floored in the 12-acre Cars Land where the Disney•Pixar’s hit movie Cars comes to life with high-octane attractions, dining, and shopping. It’s a one-of-a-kind Disney experience! And there’s much more to discover in eight themed lands including The Little Mermaid~Ariel’s Undersea Adventure and Frozen - Live at the Hyperion. Get Your Ears On and come celebrate Mickey Mouse and Minnie Mouse at the Disneyland® Resort! Swoop, swirl, dip, and curl in and around Pixar Pier with the epic Parr family! Back in the town of Metroville, the local townspeople are dedicating their beloved roller coaster to the Incredibles as a symbol of gratitude for all their heroic efforts. The honorees are thrilled to attend the inaugural “Incredicoaster” launch, accompanied by iconic super-suit designer Edna Mode, who’s graciously agreed to watch Jack-Jack. But things go awry when the unpredictable baby Jack-Jack escapes from Edna’s not-so-watchful eye. Jack-Jack manifests various superpowers while teleporting from tunnel to tunnel, causing chaos along the way. Join the Incredibles in their mad dash to catch baby Jack-Jack as he wreaks havoc throughout every inch of this high-speed chase! Round trip flight via Southwest Airlines® to Disneyland® Resort in Anaheim via Los Angeles (LAX), Orange County/Santa Ana (SNA), Ontario/L.A. (ONT), Burbank (BUR), or Long Beach, CA (LGB). *Tickets expire 13 days after the first day of use or on May 23, 2019, whichever occurs first. Each day of use constitutes one full day of use. Tickets are non-refundable, may not be sold or transferred for commercial use, and exclude activities/special events separately priced. Offer may not be combined with other ticket discounts or promotions. Subject to capacity, restrictions, and change without notice. **Savings based on the non-discounted price for the same room at the same hotel for most Sunday through Thursday nights. Savings available in DEAL room categories. Hotel savings vary depending on date of travel. Look for green savings messaging when booking to confirm the discount in your selected room category. Not valid on previously booked rooms. Subject to availability as the number of rooms allocated for this offer is limited. Limit two (2) rooms per reservation and five (5) people maximum per room. Not valid in combination with any other hotel discounts or offers. Subject to restrictions and change without notice. Separate Theme Park admission required to enjoy the Parks. ^Registered hotel guests will be advised upon check-in as to which Park will open one hour before the Parks open to the general public on select days. For admission, each registered hotel guest (ages three and older) must have a valid Theme Park ticket and active hotel room key card. Applicable days and time of operation and all other elements including, but not limited to, operation of attractions, entertainment, stores and restaurants, and appearance of characters may vary and are subject to change without notice. Subject to capacity, cancellation, and other restrictions.